Spanish rabbi and Talmudist toward the end of the thirteenth century. He was the teacher of Shem-Ṭob ibn Gaon and Nathan b. Judah, and the friend of Baḥya ben Asher, who mentions him in his Pentateuch commentary (§ Beshallaḥ). 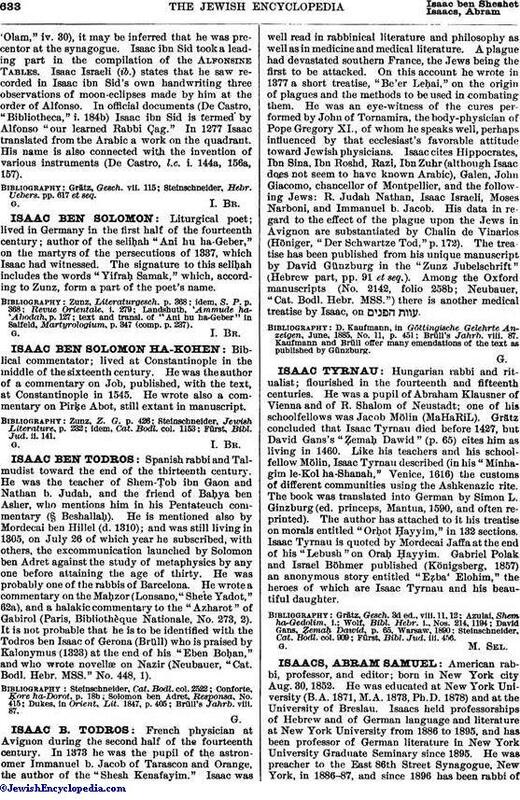 He is mentioned also by Mordecai ben Hillel (d. 1310); and was still living in 1305, on July 26 of which year he subscribed, with others, the excommunication launched by Solomon ben Adret against the study of metaphysics by any one before attaining the age of thirty. He was probably one of the rabbis of Barcelona. He wrote a commentary on the Maḥzor (Lonsano, "Shete Yadot," 62a), and a halakic commentary to the "Azharot" of Gabirol (Paris, Bibliothèque Nationale, No. 273, 2). It is not probable that he is to be identified with the Todros ben Isaac of Gerona (Brüll) who is praised by Kalonymus (1323) at the end of his "Eben Boḥan," and who wrote novellæ on Nazir (Neubauer, "Cat. Bodl. Hebr. MSS." No. 448, 1).